The first aircraft to land in Shannon was not an airplane nor was it in the twentieth century. On April 27, 1786, Richard Crosbie ascended in a balloon from Clancy Strand and travelled to the area that is now Shannon Airport. Crosbie was born in Wicklow and studied in Trinity College, Dublin. At six feet three inches tall, many already considered that the thirty one year old Crosbie’s head was in the clouds so it is unsurprising that he had his eye on the sky. In 1785, he became the first Irishman to make a manned flight. He flew in a hydrogen air balloon across Dublin. This came just 14 months after the first-ever manned balloon flight by the Montgolfier Brothers in France. Crosbie travelled throughout Ireland repeating his feat to astonished onlookers from the ground. It is probable that many of those onlookers thought that the strange apparition in the sky did not come from earth. On May 1, 1786 in a letter to the Limerick Chronicle he gave a detailed description of his flight a few days earlier. The process of inflating the balloon began at 12 o’clock but here he hit a snag as he was running low on the sulfuric acid needed to produce gas. As a new supply could not be located in time, Crosbie decided to “ proceed with caution, and I fear trespass too long on the obliging patience of my friends”. As the balloon lifted over the “River Shannon with all its little islands formed a pleasing variety I had before been unacquainted with, I determined to take a drawing of it”. His own drawing did not satisfy him as he found himself unable to capture the beauty of the scene. After examining the barometer he tossed his grappling hook out of the basket in an attempt to “accurately perceive the course” he as he was “exceedingly tossed about by the agitation of the atmosphere in the ascent”. Regaining his bearings, now he could see that he was heading west, seeing the Atlantic Ocean in front of him. The winds then pushed him towards Tarbert and he saw the Kerry landscape as “plain chequered like a carpet”. It was at this time that the balloon became almost stationary “over a small green field for upwards of half an hour”, during which time he ate his dinner and drank a “bottle of wine to the health of my numerous friends on earth”. After dinner, Crosbie decided to “explore a higher region”. As every part of him began to suffer from the cold, he took a swig from a bottle of strong lavender drops. These he “drank off without observing the strength of them, and every humid thing about me had been frozen, the lavender drops and the bottle they were in felt as warm as if they had been at the fire”. He then ascended higher than he had ever been before. He quickly found that even the lavender drops could do nothing to protect him from altitude sickness. He breathing became laboured, his heart rate increased and his “ears, from the dilation of the cellular vessels, felt as if going to burst”. As the wind began to take him, eastwards back towards Limerick these symptoms decreased. He could now see the variety of wind currents below him and could descend to “could take any of my former courses at pleasure”. Crosbie had now been in the sky for nearly six hours. He thought that he would be able to land from where he had set off from but “did not continue long enough in the eastern current, and thereby provide for a contrary inclination in my descent, I was carried with the lower one to the N.W. over Dromoland”. The attractiveness of the estate tempted him to land but “the wind blowing much stronger than I had thought, hurried me a little beyond the house before I reached the earth”. After thinking that he had secured his grappling hook to a rock, he “put out my barometer and some other loose articles and endeavoured to secure my balloon”. He then jumped out of the basket, still keeping as much of his weight on it. He called loudly for help but “one or two rustics, who I saw in a field for some time, observed me, and I thought were coming to my assistance, but to my great mortification it was quite the reverse, astonishment and fear lent them wings and they fled from me with precipitation”. Finding it difficult to hold on to the basket, to guide it towards a stone wall where it eventually slowed enough to allow him to start filling the basket with stones. The wind though caught hold of the balloon and “the wall gave way and after being dragged thro’ the breach and approaching fast the River Fergus, I was obliged to relinquish my hold and had the mortification to see my chariot re-ascend without me”. He had landed where Shannon Airport is today, the owner of the land Mr. Singleton, sent men to assist the aviator but they did not reach him in time to give him assistance. These men took him to Singleton’s house where he “experienced that hospitality which characterises the County of Clare”. As for the balloon luckily it was found by a Captain O’Brien, of Ennis. He gathered it, returning it to Crosbie, relatively unharmed. Crosbie ended his letter with “The reception I met with from all ranks of the public on my return to Limerick has made the deepest impression on my heart, and will ever call forth the gratitude and thanks of their much obliged and devoted, humble servant”. He then apologised for the “imperfect manner in which the above account is written, as I was obliged to do it in a hurry, business and various other causes frequently interrupting me”. 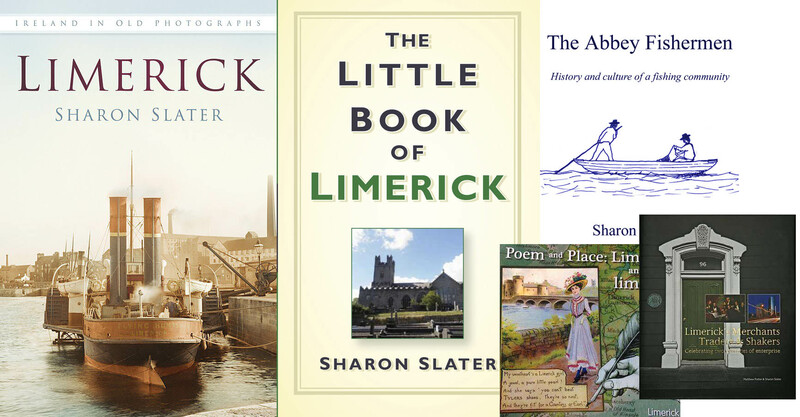 John Ferrar was the founder of the Limerick Chronicle had a keen interest in this spectacle. The amazing journey was immortalised in an engraving in Ferrar’s History of Limerick, 1787. The engraving shows Crosbie’s balloon drifting over the Limerick city. As for Crosbie the Limerick flight was to be his last, he never achieved his goal of crossing the Irish Sea. That honour finally fell to Windham Sadler in 1817 in a flight from Portobello Barracks. Instead, following the execution of his brother, Sir Edward Crosbie for treason after the 1798 Rebellion in Carlow, Richard travelled to America. He set up an unmanned balloon for public entertainment in Manhattan in 1800. He travelled widely, lost contact with family and friends in Ireland. In 1819, he was living in impoverished circumstances in Baltimore, Maryland. Soon after this, he returned to Dublin where he died on May 23, 1824. His death notice mentioned nothing of his youthful achievements, “At his house in North Cumberland Street, on the 23rd instant, in his 68th year, Richard Crosbie, Esq. youngest son of the late Sir Paul Crosbie, Bart. of the County of Wicklow”. In 2008, a statue in his honour was unveiled in the Ranelagh Gardens, Dublin where Crosbie first took to the skies over Ireland. 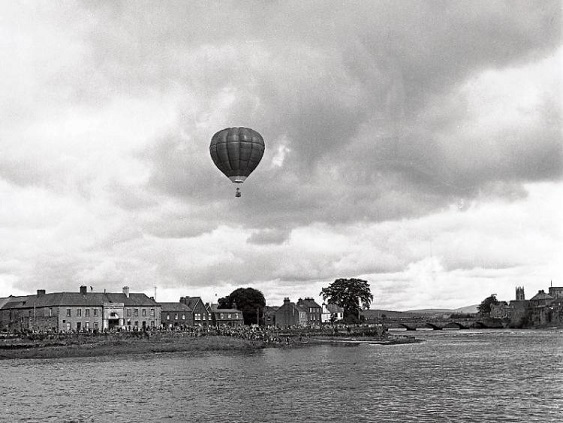 On September 12, 1970, another balloon ascended into the sky above Limerick from Clancy Strand. The balloonists were Gwen Bellew and Martin Moroney both from London travelled for 47 minutes over Limerick. About 5,000 people watched them as they floated across the city to Caherconlish. Danus, Woolmark and Kingson sponsored the flight. They teamed up with the Leader who ran a competition during this flight asking the public to state where they think the balloon would land.